Our shuttle service from Ovda Airport to Eilat is available for every low-cost flight to Ovda. The service departs from Ovda 45 minutes after the flight lands, and travel time to Eilat is around 45 minutes. If the flight is delayed, our shuttle will also wait for passengers according to the new landing time. The transfer is undertaken by our modern air conditioned vehicles with multi-lingual drivers and assistants. Dropoff in Eilat is available at all hotels in the city. 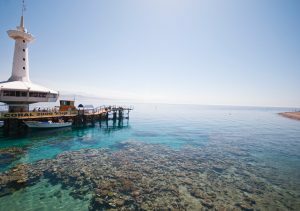 The journey from Ovda Airport to Eilat takes around 45 minutes, and price is from $8 per person. This price includes luggage, all booking and credit card fees, and free date/time change. Dropoff will be at the door of your hotel making Eilat Shuttle’s service simple and hassle-free. Simply book at our website and arrive to the airport with your voucher (either on your phone or printed). Our rep will welcome you aboard one of our modern air conditioned buses and you will soon be at your hotel for the start of your vacation. Eilat Shuttle also operates service from Ovda to Aqaba, Taba, Tel Aviv, and Jerusalem. All Eilat Shuttle services are all carried out with the full cooperation of the associated airlines and the Israel Airport Authority who manage Ovda Airport.